Spock and Kirk figure out that there is an alien intruder on board, and that it must be causing everyone to behave violently because it feeds off violence. It is also causing the Enterprise to speed out of the Galaxy (again) at warp 9. Kirk convinces Kang’s wife Mara that the alien is the real threat. Things approach a climax as Kirk and Kang are thrown into mortal sword combat, with Kirk arguing passionately that they need to settle their differences to defeat the energy being. A battle of overacting ensues, with Mara watching completely silently in the background. Spock reports that the engines are draining the dilithium crystals and the ship only has 7.9 seconds of power left. Kirk appeals to Kang, pointing out that if they keep fighting the energy being will keep healing them and making them fight for all eternity. Kang drops his weapon, stating that Klingons fight for their own purposes, not for others. Spock says to get rid of the energy being they need to show positive emotions, so Kirk starts laughing. Kang joins in, and the energy being leaves the ship. And that’s where the episode ends abruptly, leaving us to wonder how they resolve the situation of 38 Klingons on board the Enterprise. A tough episode to rate. The plot itself is decent and could have been the basis of something really compelling, but the way it’s executed is so cheesy and hammy that it descends almost into farce. Not great, but there are definitely worse episodes. Tropes: Agony Beam, Russian Guy Suffers Most, Energy Beings, Sword Fight, Flynning, Forgot About His Powers, Roaring Rampage Of Revenge,Something They Would Never Say, Space Is Cold, Hate Plague, Emotion Eater, Ham-to-Ham Combat, Neutral Female, Ludicrous Precision, Enemy Mine, Hell Is War, Weaksauce Weakness, Everybody Laughs Ending, Easily Thwarted Alien Invasion. Body count: 100 Federation colonists (probably not real), 400 Klingon starship crew. 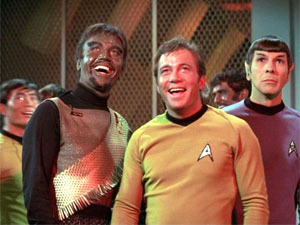 This entry was posted on Sunday, 3 July, 2011 at 12:47	and is filed under Star Trek. You can follow any responses to this entry through the RSS 2.0 feed. You can skip to the end and leave a response. Pinging is currently not allowed. I’ve always wondered where the energy being went next.